The Medeek Wall Plugin is a SketchUp Plugin that provides a simple interface for creating accurate 3D wall framing geometry within SketchUp. Welcome to the documentation for the Medeek Wall extension. Medeek Wall is a SketchUp Extension that provides a simple interface for creating accurate 3D wall framing geometry within SketchUp. This extension utilizes the SketchUp Ruby API programming interface and is compatible with the latest SketchUp releases (SketchUp Make 2017 64-bit and SketchUp Pro 2019 64-bit) as well as previous versions (2015, 2016, 2017, 2018). Electrical components (switches, outlets, service panels, lights) can be installed into wall panels with the Medeek Electrical extension. All wall types are drawn/designed utilizing industry standard practices. Additional wall types, windows and doors are in the process of being added on a weekly basis. Advanced options and features such as crown moulding, baseboard, chair rails and wainscoting are also under development. The extension allows the user to create wall panels singularily or in a polyline mode. When the rectangular wall tool is selected and the designer chooses the line mode the wall is then defined by selecting two points which form the start and end of the wall panel. When the polyline mode is chosen each point defines both a wall panel end point and the next wall panels start point. If the auto-corner configuration is enabled within the global settings the wall panels will automatically form inside or outside corners based on the angles between the wall panels. Once a wall panel is created it can be moved while at the same time remaining "glued" to other adjacent wall panels. 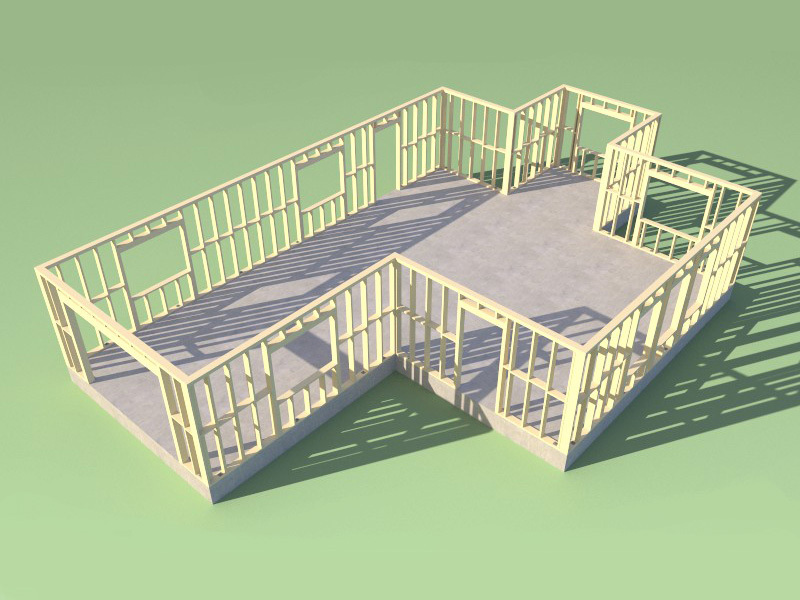 Wall framing and other options are automatically re-calculated and re-drawn as required. This level of automation provides a design tool which should eliminate the need for manual modifications to the model, which are both time consuming and can be prone to user error. Custom layers can be enabled in the global settings which allow various wall, window and door components to be placed on specific layers. Auto assignment of materials (colors and textures) are available as an option within the "Materials" and "Sheathing" tabs of the global settings. The extension currently has three primary design modes: Framing On, Framing Off and 2D. With the 2D option the walls and windows are simply represented as planar faces and lines while still allowing the user to fully manipulate the wall panels and layout of openings. This mode is intended to be a very lightweight design mode and should allow the designer to quickly put together preliminary designs. The "Framing Off" mode provides a full 3D model with all of the exterior element present however the internal framing of the wall is reduced to a single solid group. Additional elements that are found within the wall such as blocking, insulation and holdowns are not represented in this mode. The "Framing On" mode is the most detailed mode of the extension and includes all the details of the previous mode along with full wall framing, holdowns and insulation. In the full framing mode one can enable auto-dimensioning and each wall panel will receive dimensions for use in framing elevations. Advanced wall options allows for the creation of exterior wainscoting, exterior corner trim, cavity insulation and structural holdowns. The default parameters for each of these advanced options can be specificed with the global settings. With Medeek Wall, you can accurately depict conventional wood frame construction with fully integrated windows and doors within SketchUp and better validate your architectural models. The Medeek Wall extension is in the process of being integrated with a fully automated residential engineering engine. This future feature will provide structural engineering of all typical components of a residential structure and will include both vertical and lateral calculations. For additional engineering tools and site criteria maps please visit our Resourcespage. This document is intended for architects, engineers, designers and homeowners who are using SketchUp as their primary 3D design tool. It provides a basic introduction to using the extension and reference material on the available parameters/options for its use. Medeek Wall is a proprietary softare developed for use with the SketchUp 3D modeling program. There are currently no limits in its use for both personal and commercial applications. Wall Mode (required) Allows the user to draw wall panels one at a time or in a polyline fashion. Wall Type (required) Interior or Exterior walls. Wall Justification (required) Allows the user to define the wall placement relative to the line used to draw the wall. Wall Height (required) Height of the wall in inches. Wall Header Height (required) Default header height for openings in inches. Stud Size (required) Pick from a selection of standard stud sizes (nominal dimensions). Stud Spacing (required) Center to center spacing between studs in inches. Stud Direction (required) Allows the stud layout to be from either the right or left. Start Corner (optional) Allows the user to specify the corner configuration at the left end of the wall, this parameter is ignored when auto-corner configuration is enabled. Start Angle (optional) Allows the user to specify the corner angle at the left end of the wall in degrees, this parameter is ignored when auto-corner configuration is enabled. End Corner (optional) Allows the user to specify the corner configuration at the right end of the wall, this parameter is ignored when auto-corner configuration is enabled. End Angle (optional) Allows the user to specify the corner angle at the right end of the wall, this parameter is ignored when auto-corner configuration is enabled. Top Plate Qty. (required) The number of top plates the wall is constructed with. Top Plate Thk. (required) Thickness of the top plate(s) in inches. Bottom Plate Qty. (required) The number of bottom plates the wall is constructed with. Bottom Plate Thk. (required) Thickness of the bottom plate(s) in inches. Wall Group (optional) Wall panels can be grouped and then later modified in a batch mode. Wall Framing (optional) Sets the framing mode of the wall panel: 2D, 3D (No Framing), 3D (Full Framing) or CMU (concrete block). This option can be modified at anytime. Advanced Wall Options (optional) Enables advanced options for the wall panel (ie. sheathing, gypsum, cladding, insulation, trim, holdowns and blocking). Additional parameters and options are available for windows, doors, exterior trim, insulation, sheathing, cladding, gypsum, holdowns and interior trim. The trial version of the extension has all the features of the full extension however the height of walls may be limited to a specific range of values as well as other limitations on door and window sizes. The trial version is also time limited to a thirty day period from the date of installation. Once the trial period has expired you will no longer be able to create new walls however you can edit any existing walls and features. Unlicensed or trial copies of the extension also have strategically placed ads within many of the HTML user menus. The full version of the extension removes all ads. If you are a material supplier or vendor interested in advertising within the extension please contact us at sales@medeek.com, the extension currently uses Google AdSense for all ad placement. The full version of the extension is an unrestricted, permanent license for both commercial and personal use. Installation on up to (3) separate machines per licensed copy is allowed. Free upgrades to the latest version of the extension can be downloaded at any time, within two years of the initial purchase date, by logging into the Account Manager. Once the initial two year license period has expired the license can be renewed for ($20.00) on a yearly basis. If you purchase the extension through a qualified reseller you may be eligible for a discount off of the full purchase price. Please contact one our resellers for more details. The light (LT) version of the extension is also an unrestricted, permanent license for both commercial and personal use. Installation on up to (3) separate machines per licensed copy is allowed. Free upgrades to the latest version of the extension can be downloaded at any time, within two years of the initial purchase date, by logging into the Account Manager. Once the initial two year license period has expired the license can be renewed for ($10.00) on a yearly basis. The LT version includes only the 2D and 3D (framing off) modes. The LT version does not include the 3D (framing on) mode with all of the associated wall framing. It also does not include estimating and engineering features found in the full extension. This version is intended for designers who are primarily concerned only with the layout (of walls, windows and doors) and exterior aesthetics of a structure. The Medeek Wall extension will now appear in the list of available extensions. Within SketchUp select Window > Extension Manager (Microsoft Windows) or SketchUp > Extension Manager(Mac OS X). The Extension Manager dialog box is displayed. If you are a registered user you can obtain the latest version of the extension, at no additional charge, by logging in to the Account Manager. Click on the extension icon and then on your order number, if your order was placed within the last year or two then you will see a download button which will allow you to obtain the latest version. If your serial has expired since you purchased a license then a upgrade button will appear which will allow you to renew your license at a reduced rate for another year. Previews of the extension during its recent development can be viewed here. Sample SketchUp models related to these tutorials and previews can be downloaded here. View the Medeek Wall Manual (Under Construction) for detailed information on the extension and its usage. Language support is planned for the following languages: English, French, Spanish, German, Russian, Swedish, Japanese, Korean and Chinese (Simplified). Translation of the user inteface is currently under development. The current version of Medeek Wall is 1.0.9b - revision date: 04.03.2019. View the Medeek Wall Changlog for more information on updates to this extension. Download previous versions of the extension here. WARNING: Medeek Wall is currently under development and has just been moved from BETA status. The user may encounter unintended behavior due to the addition of new features on a daily basis. Always backup your data to separate file names to provide redundancy in case of file corruption or other data loss scenarios. If you have any questions or concerns about the Medeek Wall extension please call us at 1-425-652-4188.